Last episode, the identity of Zoom was shockingly revealed. After a month long hiatus, The Flash is back with a new speedster in town, one who likes to steal and cause havoc. While Barry and the team deals with this speedster, Cisco grapples with his own vibes of... Zoom. With the guidance of Harry and Caitlin and the comic relief of Cisco, Barry trains to improve his speed force by leaping across a canyon. He, after a lengthy debate with the team, goes for it, but he falls halfway across. Cisco rescues him with his drones. They head back to STAR Labs where Jessie is hanging out and watching TV. They discuss what Barry can do to become better. However, what is suggested is giving everybody a break. Team Flash deserves it, according to Cisco. Jessie begs her father to let her go with them. His initial reaction is no. (It's sort of cute, right? I mean, he wants to keep her safe after he just rescued her from Zoom.) But after some pleading and agreeing to wear a protective watch, Jessie convinces him to let her go. So Team Flash hits up a club for "fun," but they learn it's not as enjoyable as they thought. Iris and Wally show up, which gives Wally and Jessie a cute moment. (Seriously, I'm totally going to ship them now!) However, Jessie's watch starts acting up, again, and she tries to turn it off. As she fiddles with it, a recording of her father starts playing--he says he would be willing to do anything, even kill a man, to get her back. (Uh-oh.) Meanwhile, Cisco asks Caitlin to dance, leaving Barry and Iris to chat. Cisco: "Hey, so I know I'm practically your brother. And I'm like half Jay's size, but you wanna dance? Then, a speedster shows up and snatches a few wallets and purses before racing off. Barry chases after him, but he gets away. Frustrated, he returns to the club to inform Joe. Unfortunately, Iris' boss at the newspaper uses this opportunity to smear the Flash's name by calling him a petty thief. He forces Iris to write a story about the Flash's fall from heroism. At STAR Labs, Jessie confronts her father about the message on the watch. He admits it's true; he killed someone to save her. She gets upset and walks out. Team Flash starts investigating the mysterious speedster. They go through all possibilities of becoming a speedster, but nothing makes sense until Caitlin reveals there's another way someone could gain the speed force: Velocity-9. Initially, Barry is upset that they hid this from him. All this time he'd been training to get better to defeat Zoom when Velocity-9 could have easily done the trick. But Caitlin and Harry claim they hid it from him because Velocity-9 is dangerous; it ruined Jay. Cisco vibes and sees Zoom. But before he can inform them, a meta-human alert goes off. Someone has spotted the "Bad Flash." Barry races to the scene to cut off the speedster. However, she knocks him off his feet and races off. When Barry returns to the lab to inform them, Cisco is overjoyed that they finally found a Lady Speedster. They ask Barry about her and her suit. It becomes obvious that someone with a lab and tech is involved with this new speedster. Caitlin recalls asking for help from Eliza, a friend at Mercury Labs, when she was working on the Velocity serums. It's possible she used parts of the recipe to create her own speed serum. Caitlin and Joe visit Eliza. However, Eliza promises them she destroyed the original work and that nobody broke into the lab. Meanwhile, Barry says he's going to train, but Harry notices the Velocity-9 serum is missing. He follows Barry, who has the vial, and tries to convince him not to use the serum. After Harry leaves, Barry drops the vial, allowing it to shatter and the serum to spill out. Harry: You want to take a shortcut? Remember this. You lose a chunk of your humanity every time your compromise your values. Barry: I'm sorry. That's really good coming from you. Harry: So don't be like me. Be better. At Mercury Labs, Eliza talks to herself about her work. (Umm, somebody's... cuckoo.) The voice in her head prompts her to take another dose of the speedster serum she's cooked up. When she does, she walks over to a mirror and the Lady Speedster, full in costume, stares back, promising she knows where to get more serum. Team Flash reconvenes at STAR Labs when the Lady Speedster arrives. She grabs Barry and locks him in the pipeline. 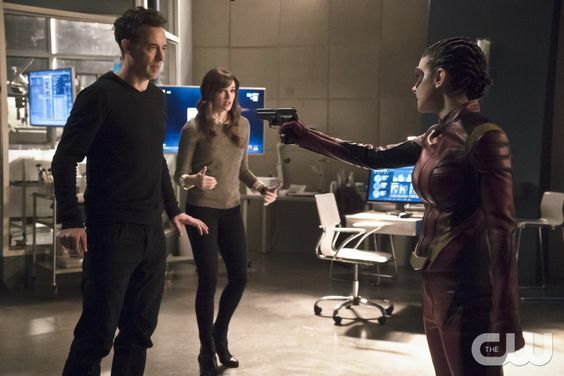 Then she confronts Caitlin, Harry, Jessie, and Cisco with a gun, demanding more serum. Apparently, Lady Speedster goes by Trajectory, and when she's in this form, there is no sign of Eliza. Cisco vibes and sees Zoom again. Trajectory grabs Jessie and holds the gun to her. Harry says they'll make V-9 for her. When they hand over the serum, Trajectory is paranoid they are tricking her. So, she injects a dose into Jessie before racing off. Jessie goes into shock, and the only way to save her is through a blood transfusion. Harry doesn't hesitate to volunteer. Jessie wakes up to Harry at her bedside. They talk. He apologizes once more for what he's done to protect her, but she's not happy. She's scared of the terrible things he's going to keep doing in order to protect her. Meanwhile, Iris meets with her boss for coffee. She tries to convince him that the Flash is not a bad guy but a hero. Somehow their conversation turns to "dating pros and cons," which catches Iris off guard. Embarrassed and a little hurt, her boss leaves. Team Flash regroups to discuss Eliza. Barry tells them about her lightning turning blue before she died. Together, they wonder if that means Zoom is sick. Just like Jay. And they also wonder if that's why Zoom needs Barry's speed: to heal himself. Just like Jay. Realization dawns. They've witnessed a speedster in two places at once, so they know it's possible. Cisco tells them about his vibes of Zoom. He says that every time it occurred he'd been standing near Jay's helmet. Barry smashes open the glass case and holds out the helmet. Cisco touches, and he vibes. Zoom stands there, like he did before, but this time, he takes off his mask to reveal Jay's face underneath. Cisco whispers "No, no, no!" and drops the helmet to the floor. Then, he turns to them. Cisco: "I saw Jay. He's Zoom." Barry races out of the lab and through town. He ends up by the canyon. He lifts his head toward the sky, and he screams. What did you think of "Trajectory"?